I have recently discovered the joys of Mason jar salads. Who says you can’t teach an old broad new recipe tricks. One of my culinary sidekicks, Katie, assured me that EVERYONE who is cooking these days is making and eating these easy do ahead meals. So, since I’m now a huge fan I’m hoping to convince anyone who wants to make to go meals even more memorable. 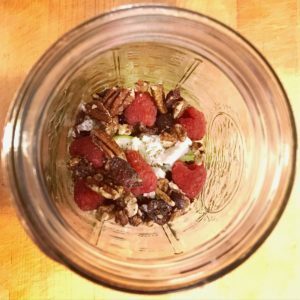 These meals in a jar are perfect for anyone who really has specific dietary restrictions (dieting, kosher, gluten free, diabetic etc.) because you can make a weeks worth of lunches or dinners in a controlled portion size. Supper for school, work and just about anywhere you need to go. Dressing on the bottom (goes in first), always! I use wide mouth (the better to layer the ingredients) quart size mason jars, never plastic containers. 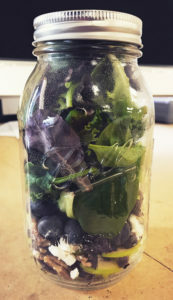 There is nothing wrong with plastic containers if you don’t have mason jars BUT the salad can last up to 5 days in glass as opposed to 1 or 2 in plastic. FYI if using avocado always toss it with a little lemon juice before adding it to the jar, it keeps it from browning. That’s it (other than the recipes). Make and store and go! I don’t eat the salad out of the jar, too messy and awkward so I suggest you can shake the jar before you pour the entire mixture on to a plate/bowl and mix to combine THEN eat.